Item Number: H20-8453MB Have a question about this item? Create attention-grabbing detail in jewelry designs with sparkling crystal and rhodium-plated beads. 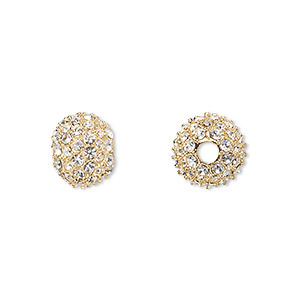 Brilliant crystals securely rest within the textured metal surface for added flash. String chain, cord or multiple strands of beading wire through the oversized 3mm hole. Bead, Dione®, crystal and rhodium-plated pewter (tin-based alloy), crystal clear, 12mm round with 3mm hole. Sold individually. 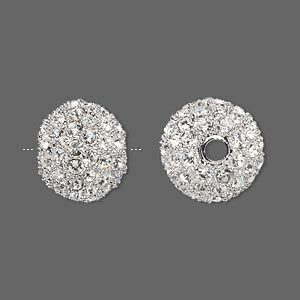 Bead, Dione®, crystal and rhodium-plated pewter (tin-based alloy), crystal clear, 14mm round with 3mm hole. Sold individually. 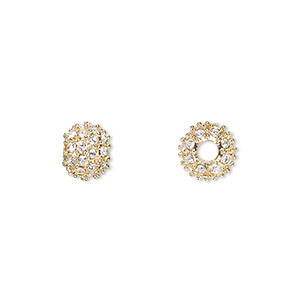 Bead, Dione®, crystal and gold-plated pewter (tin-based alloy), crystal clear, 10mm round with 3mm hole. Sold individually. 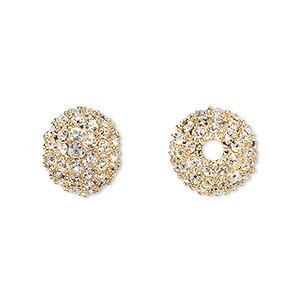 Bead, Dione®, crystal and gold-plated pewter (tin-based alloy), crystal clear, 12mm round with 3mm hole. Sold individually. 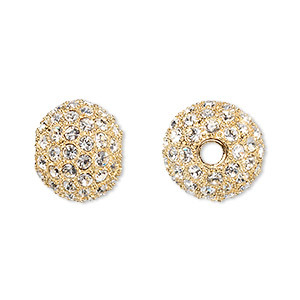 Bead, Dione®, crystal and gold-plated pewter (tin-based alloy), crystal clear, 14mm round with 3mm hole. Sold individually. 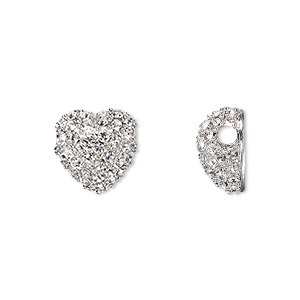 Bead, Dione®, crystal and rhodium-plated pewter (tin-based alloy), clear, 12x12mm heart with 3mm hole. Sold individually. 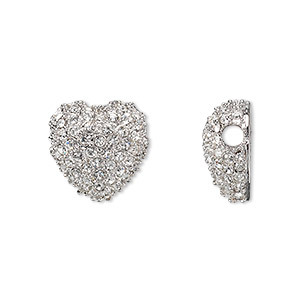 Bead, Dione®, crystal and rhodium-plated pewter (tin-based alloy), clear, 14x14mm heart with 3mm hole. Sold individually. 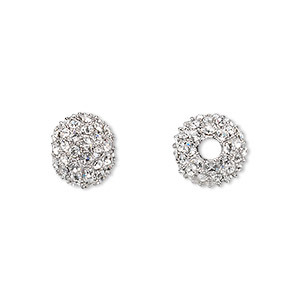 Bead, rhodium-finished pewter (tin-based alloy) and crystal, clear, 14mm round with large hole. Sold individually.